A massive avalanche plowed into an Indian army training center at a ski resort town in Indian-controlled Kashmir on Monday, killing 17 soldiers and critically injuring 17 others. The avalanche slammed into the army's High Altitude Warfare School at about 11 a.m. and swept away the soldiers during a training session, said army spokesman Col. Vineet Sood. 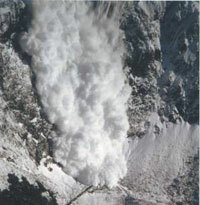 It was the worst avalanche in the area in many years, he said, The Associated Press reports. An army spokesman, Colonel J S Brar said, "Scores more were still missing and rescuers were searching for them in deep snow." He further said, "The dead included an officer, Lt Prateek, and twelve other ranks from the Army's prestigious High Altitude Warfare School." Some of those seriously injured are in a critical condition in a hospital in the scenic tourist spot of Gulmarg, Oneindia reports. The avalanche hit an Indian Army's High Altitude Warfare School (HAWS) in Gulmarg, 65 km west of Srinagar, the summer capital of Indian-control Kashmir. "The avalanche rolled down in the Khelanmarg mountain and struck the High Altitude Warfare School. Some six bodies of Indian army soldiers have been retrieved and army has launched the rescue operations at its own. No civilian local or tourist in the area has been trapped in the avalanche," said Farooq Shah, the region' s Tourism Director. The defense officials have confirmed that rescue operations are going on in the area but said details are yet to follow. "Rescue operations have been started and details are awaited," said Lt Col J.S. Brar, the Indian army spokesman in Srinagar, People's Daily Online reports.